After a flight delay in Toronto and circling around the airport for a while, my connection from Amsterdam finally landed in Detroit a couple hours late. It made for a longer day. It's always a long day when it starts with an eight hour flight. But it ended well, and I got to sleep in my own bed. Often, after a vacation, I arrive home and it seems like the visit to the far away place was a bit fantastical. Home is the same as it was when I left. Everything is in the same place. It seems like nothing has changed. Except that I was gone for a week or two or three. I had the same kind of feeling unloading the car and unpacking my bags. There were the books, CDs, chocolates, and stroopwaffles that I bought but I was back in the same place. Except there were the alterations in how I think and my outlook. So here are a few of those changes. In essence, they're the things I'll miss about being in Amsterdam. In an hour, I'll be on an airplane headed west. I have a layover in Toronto then on to Detroit later this afternoon, well, later tonight Amsterdam time. Schipholis quite the airport. There is a big mall on the arrivals level and many, many stores on the way to the gate. I'll miss Amsterdam. It's been a great visit, one that I'll reflect on for quite some time. Many memories of the many sites I saw and people I met. The highlight of the trip, of course, was spending a week with Amanda and having her along for the ride. It was much emptier when she left. Of the sites we saw, the visit to the Anne Frank house tops the list. It was a moving experience. To see the place that I read about just a few days earlier brought home how harrowing that time and place was. It's hard to imagine the courage it must have taken to go into hiding and stay there for more than two years. 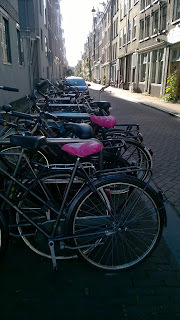 I think everyone in the world knows that bicycles are very important to Amsterdamers. 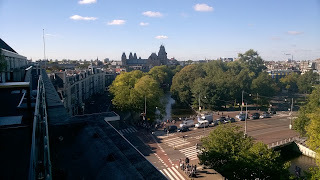 Without bikes, Amsterdam would certainly have a lot more cars and that would simply be awful. The city would be nearly impassable, I think. With bikes, it's easy to get around, and because it's such a compact city, going from one diagonal to the other is pretty quick with a bike. That is, as long as you know where you're going. Me, I never know where I'm going and making a bunch of wrong turns and ending up completely turned around is par for the course. Still a bike is an essential way to get from here to there in Amsterdam and during the trip, I came to rely on my rental bike a lot. 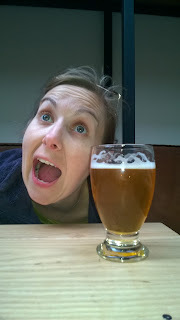 When it comes to adult beverages, it's not just about the beer in Amsterdam. Genever (pronounced yuh-NAY-ver) is also known as Dutch gin. It's origins are not completely known, but it goes back to at least the Dutch golden age in the 1600s. Genever is a distilled liquor, similar to unaged whiskey, and like whiskey can be mixed or sipped on its own. On my list of "must do while in Amsterdam" was a genever tasting. A few establishments that specialized in jenever turned up on several websites. I ended up at De Admiraal. It wasn't too far from the apartment and had good reviews from previous visitors. Walking into the tasting room was like taking a step back in time. The place is lined with dark wood and the light is dim. Most of the light coming in was through the open door, which led to a small seating area next to the sidewalk. I sat inside at a small table. The Van Gogh Museum is near the top of most Amsterdam "must see" lists and after my visit, it's easy to see why. The museum is housed in a modern building that helps to emphasize Van Gogh's modernity and continuing influence on art. The museum is arranged more or less chronologically with the exhibits from his early years starting on the first floor and his more mature works appearing on the second and third floors. Van Gogh seems to have been a prolific letter writer and his correspondence, especially with his brother Theo, is showcased on the second floor, too. 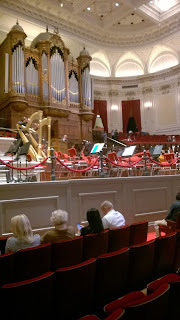 Sunday I attended an afternoon concert at the Concertgebouw. It was without a doubt one of the finest concerts I've ever heard. Not only is the Royal Concertgebouw Orchestra one of the top orchestras in the world but the grand hall has astounding acoustics. I was sitting stage left, quite a bit left, in row 11. The cellos were over on the far right and I felt like I was sitting right in front of them. I've always thought that Orchestra Hall and the Opera House in Detroit have excellent acoustics and I think they do, but the Concertgebouw seems to be on another plane. The soloists were two young pianists who happen to be brothers and Dutch. Arthur and Lucas Jussen, only now in their mid-twenties, have been playing for more than 10 years. I think it's safe to say that they are at the beginning of what will be a stellar career. High on my list of museums to visit was the Rijksmuseum. It is one of the "must see" sights on everyone's list. The museum recently re-opened after a significant renovation and it is very impressive. The collection is housed on four floors, although most everyone seems to congregate on the second floor where the Rembrandt, Vermeer, and Steen paintings are hung. These aren't them. I guess it does show that cute cat pictures were popular before the Internet. 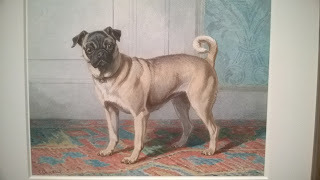 And what can you say about pugs? Great dogs. And yes, the Rembrandt and Vermeer paintings were also great. I was also taken by this picture of the Dutch countryside. It's by Paul Joseph Constantin Gabriel and is called "A Windmill on a Polder Waterway." I was struck by the way he used the canal to reflect the rest of the picture. Quite a captivating picture I thought. After a very soggy weekend, the week started off with pleasant autumn weather.